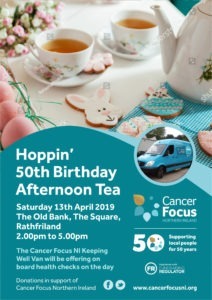 What a lovely way to spend the afternoon than with family and friends enjoying tea, coffee and treats whilst raising vital funds for Cancer Focus NI and those affected locally with a cancer diagnosis. Come along on Saturday 13th April to the Old Bank, the Square, Rathfriland from 2pm-5pm to get into the Easter mood. For more information you can contact Barbara Long on 07436 039755 or any of the Rathfriland Cancer Focus group members.